Celebrity Cruises Australia – Who are they and why choose them? Compare Cruise Lines – which is the right one for you? Packing tips for Cruises – don’t make these mistakes! First time cruise checklist – you need to read this! 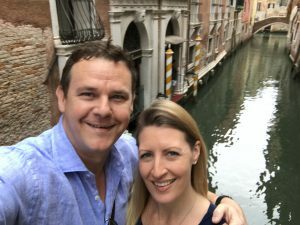 Welcome back to my Cruise Travel Blog – I can’t believe it’s been one week on board the beautiful Viking Sun already. In that time I’ve visited five countries, four of them new to me. Have you ever used the app ‘Been’? It tracks the countries you’ve visited, the Production Crew on here are all using it, apparently I’ve clocked up sixty countries; not too shabby! I’ve definitely settled into the ship life, our cabin is our cosy home with a drawer or shelf for everything. We’re in a crew cabin but its more than sufficient for us. There is a lot of storage, a big pull-out drawer-style fridge (perfect for standing bottles of champagne as we’ve already discovered!) and even a compartment with a mirror and light with space for make-up/jewellry in the dressing table. There are USB chargers everywhere too which is perfect for us with our multitude of devices. The lighting is also very cleverly designed, with main switches on both sides of the bed, along with a low light for seeing your way to the bathroom at night. There are also side lamps and little reading lights as well as another light on the dressing table. In the wardrobe is a sensor light which comes on as you slide the doors or reach in for clothes. We have a 42-inch flat screen TV wall-mounted in front of the bed, showing several news channels, ITV live (English terrestrial) and lots of movies and some TV series. The bathroom is hotel standard. The shower is a good size and powerful, with a shelf/seat for toiletries – also great for leg shaving! We each have our own drawers and several shelves and the sink is a classy rectangular shape, wide enough for us both to brush our teeth at the same time. Alfredo is our room steward, a really lovely guy from the Philippines with a wife and two sons at home who he sends his salary back to each month. He told me how much he misses his kids, particularly now his youngest has just started talking and says ‘Dada’ to him on FaceTime. He’s away from them for 7 months, then gets 2 months off to go home. He feels proud that he is able to support them in this way and gets the chance to travel the world, but told me his regular calls to them make him teary and homesick. My heart ached for him, we often forget how hard some people’s lives are compared to our own. I’m not permitted to show photos of crew areas, but hopefully I’ve given you a good idea of our living quarters with the above description. My first full day on board we docked in Warnemunde. 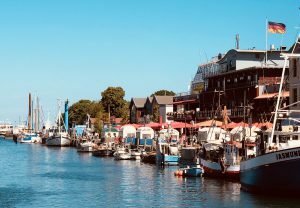 This is a port where guests can choose to do an excursion to Berlin which is a couple of hours drive away, so a full day out for them. As Beven obviously can’t leave the ship for long each day, we got off for a few hours to go explore the local town. This is a great port for being right at the heart of everything, we literally walked about five minutes to get out of the main port area and then we were in this exquisite little town on a canal, with bright flowers everywhere and little food stalls selling every type of German sausages and snacks. We crossed the canal and walked up towards the beach where a large event was going on, something ‘iron-man’ style. It was quite busy so we continued into the old town streets and ordered some curry-bratwurst sausages with bread. 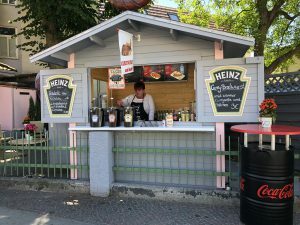 It seemed a little less authentic with the big bottles of Heinz but it really was delicious! From here we went to a pub overlooking the canal and ordered some local beer and wine whilst soaking in the atmosphere. Before heading back to the ship, we went to the local supermarket, where all the crew stock up on their daily necessities. It was packed! The aisles of chips/crisps looked like a swarm of locusts had been through closely followed by the lolly/sweet aisle, and the check-out queues took up half the store. Beven has started a tradition of always having chocolates in his office for people to come grab whenever they want a chat so we walked out with a very large eco-bag of every type of junk food… I definitely need to hit the gym. Later that afternoon I got to experience the Welcome Back/’happy clappy’ ceremony that Viking gives to its guests at least once a cruise, usually when they’ve all been on a large excursion, such as today’s one into Berlin. 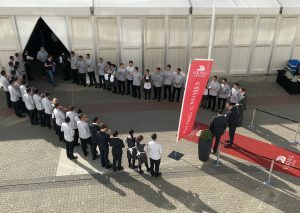 The crew and officers all line up along a red carpet and clap and dance for the returning guests who are given champagne on arrival. Its not something I’ve seen before and thought was such a lovely touch. The evening entertainment was from Nik Page who had performed in Les Miserables in the West End for many years and now works as a guest entertainer on the ships singing Broadway hits and showing off his piano and drumming skills. We finished the night in Torshavn bar with the Production Cast for a nightcap. 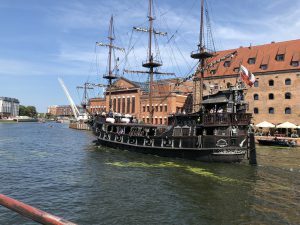 There is a short shuttle bus which takes you to the city of Gdansk from the port. It leaves every half hour and is complimentary for the guests. Its not the prettiest of drives, passing gray stark-looking buildings and ones which look like remnants of war bombings, but the drop-off point is in a pretty cobbled area just next to a pedestrian bridge. The bus guide informed us that the bridge rises every hour, so in order to catch the bus, you need to ensure you are on the correct side of the bridge at least five minutes before. Ok, duly noted. We had a couple of hours before Beven needed to be back on board again so we started off over the bridge to explore. The river is lined with bars and restaurants, offering local food and ‘alcohols’. The buildings are tall, a mix of old and new-trying-to-be-old and quaint streets which appear through little arch ways. The weather was beautiful as we walked along, watching a traditional pirate boat sail by, next to a little plastic looking car-boat! We found a restaurant sunken down into the pathway with beautiful plants and waitresses dressed in traditional outfits and ordered a couple of drinks to enjoy the view with. Our waitress recommended a local beer for Beven and a Prosecco for me. As we decided it was time to leave, Jamie, the Production Company Manager, came over to say hi, he was looking for the rest of the team who were in a nearby bar. We paid our bill which was a welcomed ‘normal’ price and headed to the next bar to join Jamie, Matt and Sophie and without much persuasion, Beven agreed to stay for another drink. Beven had planned to do a first-time ‘Liar’s Club’ show this evening, so we put our creative brains together to come up with some ‘lies’ for the words he was presenting himself. If you’ve not heard of this show, it’s based on the game Balderdash, where each person is given a word and has to create a meaning for it, and then players have to guess which meaning is correct. Its a lot of fun and a favourite in our household. Anyway, realising that the bus we needed was leaving shortly, and that the bridge was about to open, we paid quickly and ended up running through the crowds, racing each other to get there in time….which we did, just! This evening’s show was the Production Cast’s ‘Broadway in Concert’, a show which was originally a casual ‘sing-a-long’ in the atrium but Beven has developed to move into the Star Theatre, get backing tracks and turned into something much more professional and really fantastic. The audience loved it, and Beven got a standing ovation for his ‘Unchained Melody’ in the middle. It was interesting that as he walked on, some people started laughing. The audience had only seen Beven as the jokey Cruise Director, they didn’t know he sang! We went to the World Cafe to grab dinner after and he could barely take 5 steps without someone stopping him to congratulate him on a wonderful and unexpected performance. I was a proud fiancee! The night finished with the Liar’s Club which was a huge success and a lot of fun, followed by what seems to be a regular nightcap in Torshavn. I love sea days. A day to relax and enjoy everything the ship has to offer. Also, time for me to hit the gym and start burning off some of the amazing food we’ve been eating! The gym is very high-tech on Viking Sun. There are several areas, the first has elliptical machines and a stepper and opposite are the resistance machines and a rower. The next room has treadmills, all touch-screen with TV channels etc and then you move into the cables, yoga/stretching area and into the free weights section. I’m mostly a free-weights kinda girl, so I love that they have two versatile benches and a great range of free weights with a large mirror in front and views of the ocean to the side…perfect. I spent most of today on my laptop, catching up on some work and also relaxing. I mean, this cruise life is exhausting you know. Dinner in the main restaurant tonight – delicious – and the second performance by the comedian rounded out this evening. I’ve realised this is becoming a mammoth blog for one read, so I will split the week up and post Part 2 shortly. As always, please give me feedback or any comments as I love to hear from you!